Irvine is home to thousands of military veterans and members of the active military returning from deployment overseas. 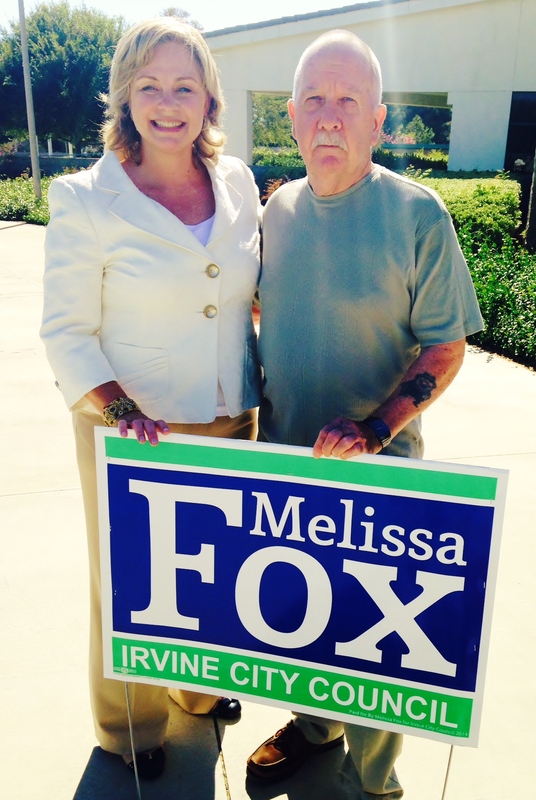 These veterans should be represented within Irvine’s city government by a Veterans Advisory Committee expressly dedicated to the unique needs and interests of the men and women who have served and are currently serving in our nation’s armed forces. 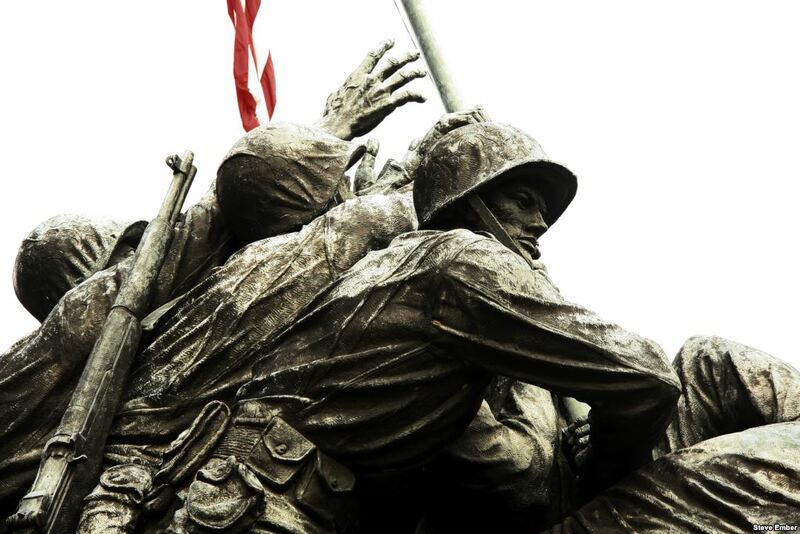 One of the key lessons of the fight for the Irvine City Council’s approval of a Veterans Cemetery and Memorial in the Great Park is that Irvine needs a permanent Veterans Committee, composed solely of Irvine veterans, to advocate for veterans and advise the City and the Council on veterans’ issues. The Ad Hoc (temporary) Veterans Cemetery Committee established by the current Council majority of Mayor Steven Choi and Councilmembers Jeffrey Lalloway and Christina Shea during the fight for approval of the Veterans Cemetery was anything but an advocate for veterans. It all began in March, when Councilmember Larry Agran, himself a veteran, having served in the U.S. Army Reserve, introduced a resolution supporting AB 1453 (creating a state Veterans Cemetery in Orange County) and, more importantly, expressing the City Council’s strong interest in locating the Veterans Cemetery in the Great Park (formerly the Marine Corps Air Station El Toro). 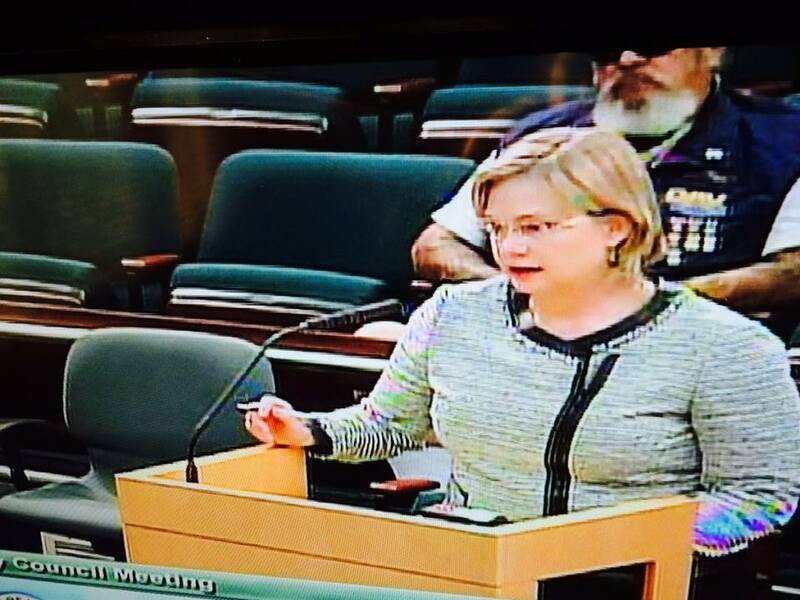 Irvine Commissioner Melissa Fox urging the City Council to set aside land in the Great Park as a final resting place for Orange County veterans in March 2014. The resolution passed, over the objection of Mayor Choi, who made clear his opposition to a Veterans Cemetery in the Great Park because a big developer – FivePoint Communities – thought it might affect the prices of the homes it plans to sell in the area. The Council then set up an Ad Hoc Committee, supposedly to identify a specific site for a Veterans Cemetery in the Great Park. However, it soon became apparent the real purpose of the Ad Hoc Committee created by the Council majority was to delay and obstruct the search for a site in the Great Park, and at the same time to try to find a site somewhere else – anywhere else – in Orange County, in order to please the developer. The Council majority appointed Mayor Choi as the Ad Hoc Committee vice chair – despite his publically announced opposition to a Veterans Cemetery in the Great Park because of FivePoint’s objections. They appointed Councilmember Jeffrey Lalloway as the Committee Chair, who then insisted on placing nearly every one of his local political cronies on the Ad Hoc Committee, not one of whom is a veteran. 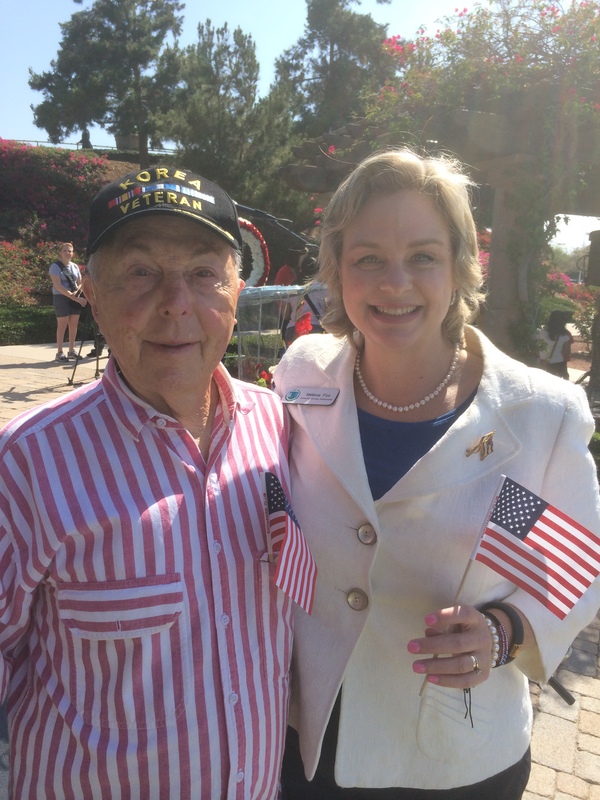 The only U.S. military veteran on the Irvine City Council – Councilmember Larry Agran, who was also the author of the resolution and a strong advocate for locating the Veterans Cemetery in the Great Park – was deliberately not placed on the Ad Hoc Committee. After excluding the only U.S. military veteran on the Council from the Ad Hoc committee, Choi, Lalloway and Shea insisted that a Five Point representative be included on the committee. 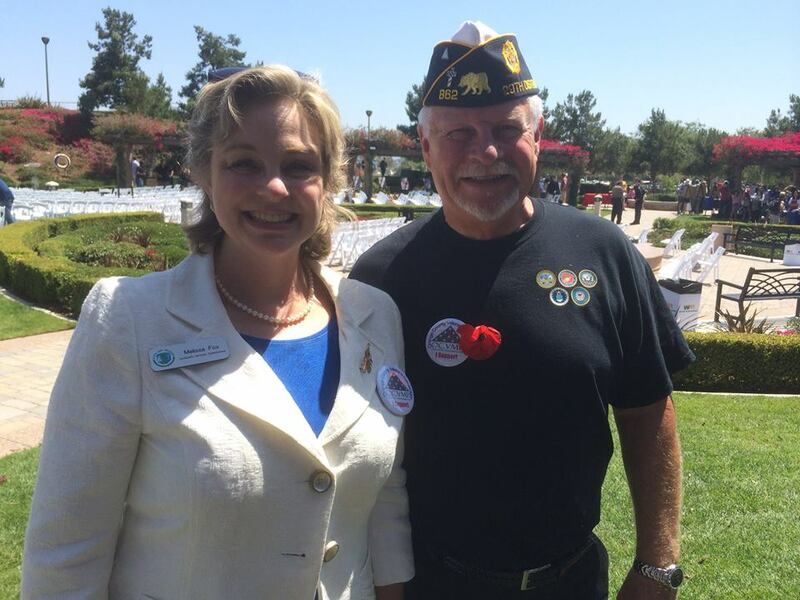 Only one Orange County veteran (USMC veteran and VFW Chaplain Bill Cook) and one long time veterans advocate (Isabelle Krasney) were made part of the Ad Hoc committee. By late April, the Ad Hoc Committee created by the Irvine City Council majority had not met and had not conducted any business. Veterans groups were becoming increasingly concerned that the Ad Hoc Committee was not interested in finding a location for a Veterans Cemetery in the Great Park, and that the Committee was a sham, set up only for show, not to take action. 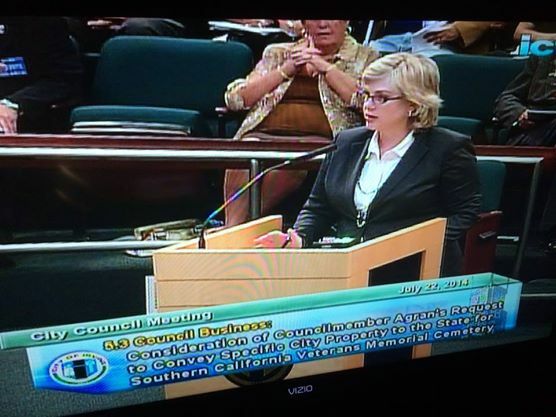 In response to the Ad Hoc Committee’s inaction, Orange County Veterans Memorial Park group (OCVMP), along with many leaders of Orange County veterans’ groups, including the Veterans of Foreign Wars, the American Legion, and the Disabled American Veterans, issued a “Call to Action” to attend the next Irvine City Council meeting, where I, among others, called on the Council to fulfill its promise to create an Orange County Veterans Cemetery in the Great Park without delay. In mid-May, we learned that the Ad Hoc Committee still had not met because, supposedly, many of the politicians who were added by Jeff Lalloway as Ad Hoc Committee members, including Irvine Mayor Steven Choi, could not find the time for a Committee meeting in their schedules. In addition, the Ad Hoc committee refused to provide a progress report (or, rather, a lack-of-progress report). 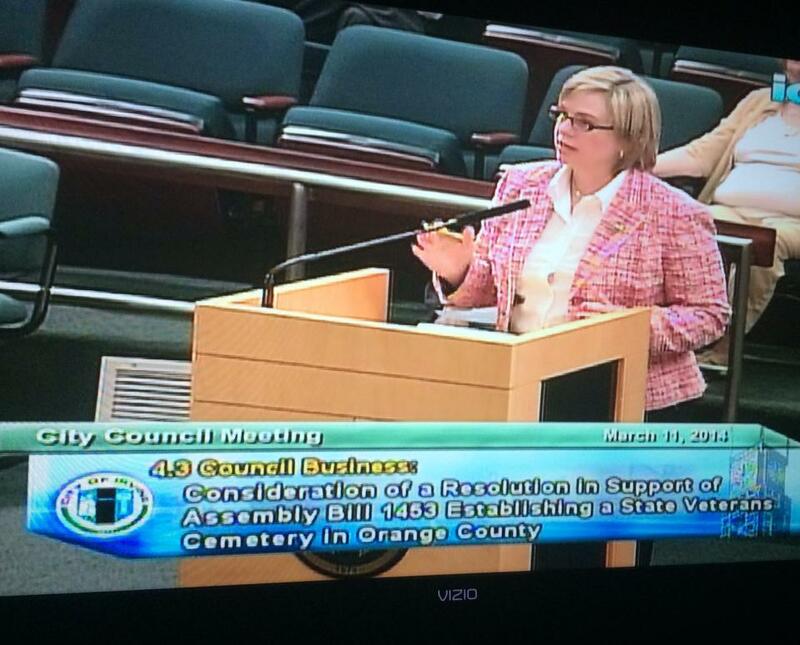 My comments, as well as the comments and questions raised by numerous veterans about the seriousness of Irvine’s commitment to an Orange County Veterans Cemetery, were met with stone cold silence from the Irvine City Council majority of Choi, Lalloway and Shea. By late July, AB1453 has sailed through the Assembly and was going through the final phases of the legislative process. Senator Lou Correa’s Senate Veterans Affairs Committee had passed the bill on June 24th and sent it to Senate Appropriations Committee with the recommendation to approve it. 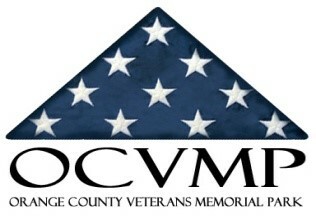 The only thing missing to make an Orange County Veterans Cemetery a reality was a decision by the Irvine City Council to make a portion of the Great Park available as its location. When speaker after speaker after speaker, including Bill Cook, the only veteran on the Ad Hoc Committee, then spoke in favor of the resolution, the Council majority was forced to concede that they had been licked, that their strategy of using the Ad Hoc Committee as a means of delay and obstruction had failed. They then voted in favor of the resolution. What this experience teaches me is that Irvine’s veterans need a strong, permanent voice of their own in city government, not adulterated by developers or by politicians whose interests may well conflict with those of the veterans they supposedly serve. This entry was posted in Uncategorized and tagged AB 1453, Assembly Bill 1453, Assembly Member Sharon Quirk-Silva, Assemblywoman Sharon Quirk-Silva, Bill Cook, California Department of Veterans Affairs, California veterans, California Veterans Affairs Committee, California veterans cemetery, Chaplain Bill Cook, Christina Shea, City of Irvine, Council Member Christina Shea, Council Member Jeffrey Lalloway, developer opposition to veterans cemetery, El Toro Marine Base, El Toro Marine Corps Air Station, FivePoint, FivePoint Communities, FivePoint opposition to veterans cemetery, Great Park, Great Park Irvine, Irvine, Irvine Ad Hoc Committee, Irvine Ad Hoc Veterans Cemetery Committee, Irvine Ad Hoc Veterans Committee, Irvine City Council, Irvine city planning, Irvine Community Services Commission, Irvine Community Services Commissioner Melissa Fox, Irvine Council Member Christina Shea, Irvine Council Member Jeffrey Lalloway, Irvine Mayor Steven Choi, Irvine military veterans, Irvine veterans, Jeff Lalloway, Jeffrey Lalloway, Larry Agran US Army veteran, Larry Agran veteran, Marine Corps Air Station El Toro, Marines, Mayor Choi opposition to veterans cemetery, Mayor Steven Choi, MCAS El Toro, Melissa Fox, Melissa Fox blog, Melissa Fox Irvine, Melissa Fox veterans, melissafoxblog, melissafoxblog.com, melissajoifox, OCVMP, OCVMP Committee, orange county ca veterans cemetery, Orange County Great Park, Orange County veterans, Orange County veterans cemetery, Orange County Veterans’ Memorial Park Committee, Riverside Veterans Cemetery, Sharon Quirk-Silva, Southern California Veterans Cemetery, Southern California Veterans Cemetery Bill, Southern California Veterans Cemetery legislation, Southern California Veterans Cemetery Master Development Fund, Southern California Veterans Cemetery Perpetual Maintenance Fund, Steven Choi, Steven Choi opposition to veterans cemetery, veterans, veterans cemetery, veterans in California, veterans in Irvine, veterans legislation, veterans legislation California, VFW Bill Cook. Bookmark the permalink.